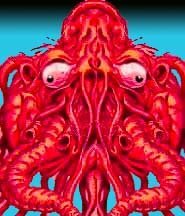 Ah, there I am in 1988. 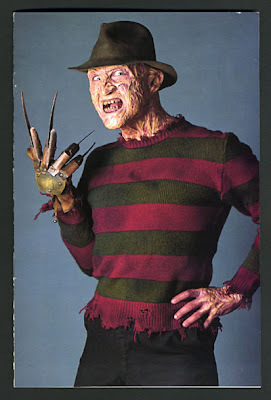 By the time I'd caught on to the Nightmare on Elm Street franchise (my first exposure was "Part 3" thanks to a friend's satellite dish) Freddy was a wisecracking cartoon of a supervillain who seemed perfectly tailored for my comic book saturated brain. The dream element also had tremendous appeal and ironically, witnessing his R-rated antics made me feel like I'd finally crossed into a higher level of entertainment that was reserved strictly for discerning adults. 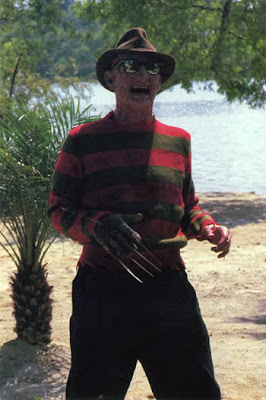 Freddy became the obvious choice for Halloween, but this proved challenging since any manner of Krueger garb was extremely rare, especially in rural, pre-internet Arkansas. I followed a rumor and was able to track down an officially licensed mask in a mall gift shop some 30 miles away. Next, I braved strange looks as I searched ladies' boutiques for the perfect red and green striped sweater. (I scored, but when I tried to char it for authenticity sake I over-burnt it to the point that my mom had to sew a black t-shirt inside to prevent the garment from disintegrating.) My claw was a product of many afternoons in a friend's grandfather's workshop where I constructed it out of scrap metal and four steak knives straight from the Wal-Mart kitchen department. Then I learned I could achieve an extra level of repulsiveness by lathering down my mask with Vaseline right before public appearances. 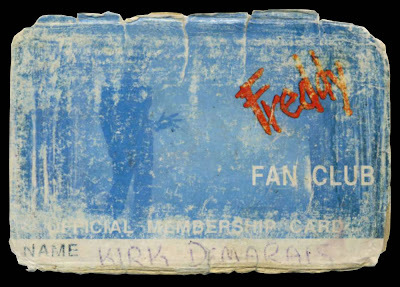 I was a teenage Freddy fan. Both the cassingle format and the eco-unfriendly "longbox" are now obsolete. 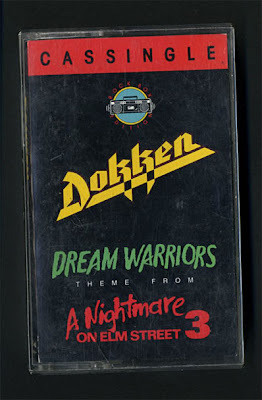 Dokken too. It's the "Rock Box Edition," Fantastic! Oh, wait. That's completely meaningless. Say, a Freddy Fan Club sounded pretty good. And according to this, there was no club like it. I filled out a self-addressed, stamped envelope immediately. I also made a mental note to read the paperback from St. Martin's Press. Many package-less months passed until I'd finally resigned myself to the fact that I was just another victim of mail fraud. Then my Freddy stuff arrived. Freddy types in all caps. Freddy lives in New York City. Freddy isn't a details kind of guy. (He neglected to sign the letter.) Freddy's writing lacks clarity... "IF YOU HAVE ANY QUESTIONS OR WOULD LIKE AN ANSWER TO ANY SPECIFIC QUESIONS(THAT WE CAN ANSWER)PLEASE INCLUDE..." But if you're familiar with the razor-gloved one then this is not at all surprising. It reads like a treatment for a Nightmare prequel. 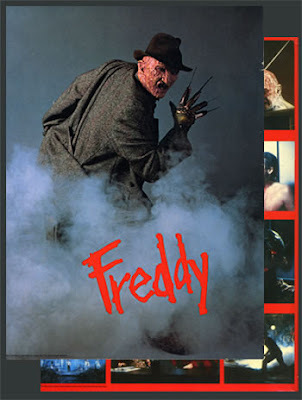 It recounts Freddy's childhood and teen years and covers stuff the movies didn't (like how Freddy was raised by a pimp). This version of his backstory was eventually abandoned and rewritten for the later sequels. I found it amusing that the back of this would-be school supply was covered with stills of some very gruesome moments. I never risked taking it to class. 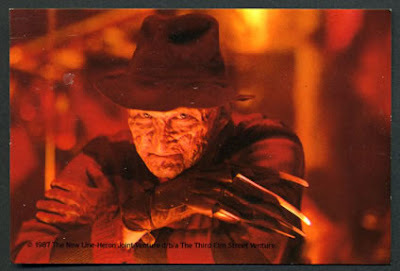 This four page pamphlet features the same image as the membership application, minus the Freddy logo. It consists mostly of quotes from FX guys who worked on the first three films. Although my folks were none too excited to see my wall turn into a massive billboard for the Elm Street series. The only thing not pictured here is the membership card. I don't actually remember getting one, but I'm sure that if I did I wouldn't have been able to resist filling it out and placing it in my wallet. And that may be why it's missing. That's great stuff. 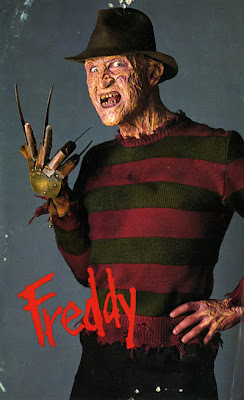 Also in 1988 was the TV spin-off Freddy's Nightmares. I was 7 years old when that show was on, and it was mind-scarringly scary for a kid that age. I would quickly flip past the program with my eyes half-closed and flip back, far too scared to watch it directly. What's more, I liked your quote about feeling as if you had entered a different plane of entertainment once you started watching 'adult' Horror movies. In 1990, I remember finding a box of VHS tapes with random HBO movies recorded onto them (we didn't have HBO; they were dubbed by a friend of my parents). I introduced myself to the world of HBO and R-rated films that year, and indeed, it was like a magical world that moved me up in the cultural landscape. Kirk, I'm always impressed that you have kept so many of your childhood toys, magazines, etc. etc. It's too bad i didn't do the same. Then i wouldn't have to spend so much money on ebay retrieving them! I have an interesting Freddy souvenir, a scar on the back of the main joint of my right middle finger which was sliced open by Mr. Krueger's bladed glove--the real thing. 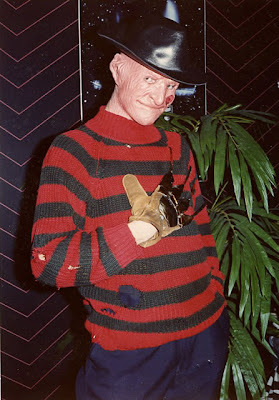 I met Robert Englund at a screening for Nightmare 2, and the next day he was in full costume doing a promotional appearance at Forbidden Planet in NYC. I happened to be in there, and surprisingly he didn't have a large crowd. He spotted me and recognized me, and we did the automatic hand shake. Just before our hands met, he must have realized what he was wearing and warned "Watch the blades they're really sharp" but it was already too late as one of them cut into the back of my finger. I was really surprised that the blades were real. I guess that would authenticate the screams of the fleeing teen victims in his movies. It never occurred to me to sue New Line Cinema. 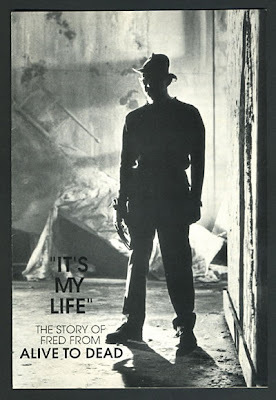 Like just about everybody, I watched and enjoyed the Elm Street movies when they came out. Being a kid from the '60s and '70s(when the old Universal horror films were all the rage), though, I felt kind of old when I heard a radio news item stating that Freddy had replaced Frankenstein as the world's most popular monster. Around the same time, a friend of mine was watching two kids playing when one shouted to the other "You be Freddy Krueger!" - a far cry from the cowboys and astronauts we used to pretend to be. Side tangent: I've plenty of old cassingles in the closet in boxes, but the long box ... wow. There's a blast from the past. I haven't even thought about those in a long time. 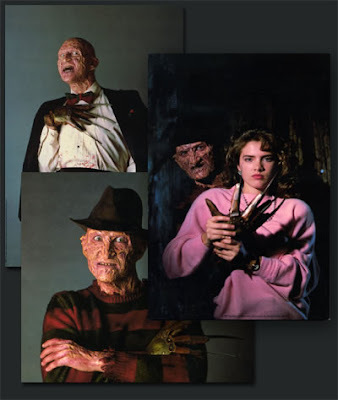 Do you guys know the story of the Talking Freddy Krueger doll sold by Matchbox (this was before Mattel owned them) in 1988. This 2 foot tall doll showed up in all the toy stores labeled for "8 years & older". Then some parent groups informed the Matchbox executives that Freddy was a child molester and they had to pull all the toys. What were they thinking? I used to have daydreams about constructing my own glove. I'm just not that motivated I guess. cdp- I remember Freddy's Nightmare's very well. Of course I was pretty pumped when I heard about. I thought the first episode (about Freddy) was ok but soon they lost my interest. At that time those anthology shows were everywhere... Tales from the Darkside, Monsters, Tales from the Crypt, Friday the 13th series, etc. maybe it was just overkill. plcary- Yeah, I've always been a pack rat. 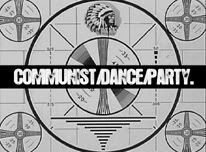 I'm just glad there's now a forum for me to actually get some use out of them. rozum- thanks for your amazing Freddy story! That's worthy of a full post on your blog. I hope at the least you've gotten a lot of mileage out of it. You've got a conversation piece attached to your body. Although Freddy stories probably don't go over so hot at society events. dane- I've got a stack of cassingles in the garage. Paula Abdul, Fine Young Cannibals, G n'R, etc. I'm almost ashamed to say I still have a stack of CD longboxes too. flashfink- I read a pole several years back and Freddy had dropped back to number two, right behind Frankenstein. That sounds more like it to me. dan- I remember the doll well. I just looked and they're surprisingly cheap on ebay. Yeah, I never got the marketing of Freddy to children. Definitely an anything for a buck scenario. I used to have a freddy bubble gum dispenser, go figure. shawn- Ah, Yes Shocker. Saw it in the theater and I can't say I had a good time. I remember that song too. Please tell me that Freddy pin is for sale! I'm obsessed with it! I hope your obsession is not of the hunt/kill-to-get-it variety because it is my personal duty to guard this set until I leave this earth. 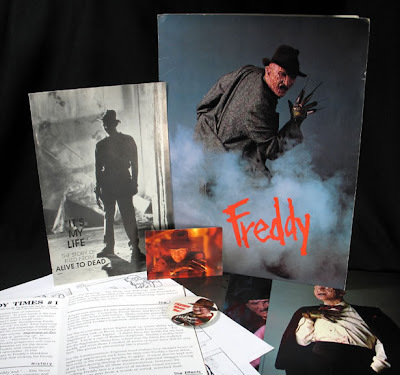 Even then the Freddy Fan Club kit is scheduled to be cremated with my remains. Sorry. But thanks for visiting Secret Fun Blog!